Reality Check: Most Scientists Never Believed In "Global Cooling"
Climate-change deniers like to remind us how, in the 1970s, scientists all believed the Earth was heading for another ice age. So why should we believe the doomsayers who now claim the opposite? Here's why: Most scientists rejected the "global cooling" theory and, even then, were convinced the real problem was global warming. Unfortunately, the "global cooling" myth just won't die. It's like the Big Bad in a horror movie: You can kill it, set it on fire, cut off its head — and it just comes back, year after year, in a never-ending succession of lame sequels. If this meme were limited to the sort of fringe websites that fret about the Freemasons and Lizard-people, it would be one thing. But, "global cooling" remains a top talking point among policy wonks, pundits and members of Congress. "The entire scientific community was in lockstep with it, and doubters, well they were idiots if they dared deny it," Neil Cavuto recently declared on Fox News. During a Congressional hearing this past April, Republican members on the House Committee on Science, Space and Technology, ridiculed the White House's stance on climate change. "I remember the 70s, that was the threat," said Bill Posey (R-FL). "We're going to have a cooling that's eventually going to freeze the planet, and that was the fear before Al Gore invented the Internet…." There was indeed hype in the 1970s about a coming ice age, but it was a media-invented hype that not only misunderstood the actual science of the era, but also egregiously misrepresented it. The real story of what happened in the 1970s was that climate change was emerging as a credible field of scientific study, thanks to new discoveries, a growing abundance of data and the increasing sophistication of instruments and computer modeling. Prior to that, there was plenty of speculation, but no hard evidence. As far back as 1861, the British naturalist John Tyndall attributed dramatic variations in climate (notably, the previous ice ages) to changes in the composition of the Earth's atmosphere. Certain molecules, he suggested, could absorb thermal radiation, and therefore might be the cause for "all the mutations of climate which the researches of geologists reveal." Thirty years later, the Swedish physicist Svante Arrhenius estimated that a doubling of atmospheric carbon dioxide would raise global temperatures by as much as 43 degrees Fahrenheit. However, he concluded it would take 3,000 years of burning fossil fuels to do so. But, by the late 20th century, scientists finally had the means to accurately determine concentrations of greenhouse gasses in the atmosphere. In 1957, research stations for measuring carbon dioxide had been established in Antarctica and atop the Mauna Loa volcano (above) in Hawaii. And, by 1965, the data was sufficient to unambiguously show that carbon dioxide was increasing in the atmosphere at a rate far quicker that Arrhenius had calculated. The data prompted the U.S. President's Scientific Advisory Committee to warn that human-caused emissions of carbon dioxide could "modify the heat balance of the atmosphere to such an extent that marked changes in climate, not controllable through local or even national efforts, could occur." Not long afterwards, researchers developed the first true three-dimensional climate model. By 1975, the modeling had become sophisticated enough that noted scientists such as Wallace Broecker stated that we were "on the brink of a pronounced global warming." But, during this same period, a conundrum presented itself in the form of increasing aerosol levels in the atmosphere, which could cause temperatures to cool by deflecting sunlight. Some scientists raised the possibility that, over time, the cooling effect caused by aerosols could overtake the warming effect of carbon dioxide. Arguably, the most famous paper to make this case was published in Science, by S. Ichtiaque Rasool and Stephen Schneider. They calculated that an increase by a factor of 4 in atmospheric aerosol concentrations—which couldn't be "ruled out as a possibility"— would be sufficient to bring about an ice age. But later research by both the original authors and other scientists found that their conclusions were flawed — partially because they had used a static model that didn't allow for changes in convection or clouds. Consequently, they had underestimated the warming effects caused by carbon dioxide. On measure, the scientific consensus during the 1970s was strongly supportive of the theory that greenhouse gas emissions were causing global warming — and a study published in the Bulletin of the American Meteorological Society has the numbers to prove it. Researchers surveyed the peer-reviewed scientific literature published between 1965 and 1979. They found that 44 studies favored the theory of global warming, 20 studies were neutral and 7 studies supported the theory of global cooling. The divide was even more dramatic when tallying up the number of citations for the studies: articles that supported global warming had 2,043 citations compared to those on global cooling, which had 325. This is how climate-change deniers define a "scientific consensus" in favor of global cooling. But, while the consensus supported the view that our planet was warming, it was the speculation about global cooling that received disproportionate coverage in the mainstream press. 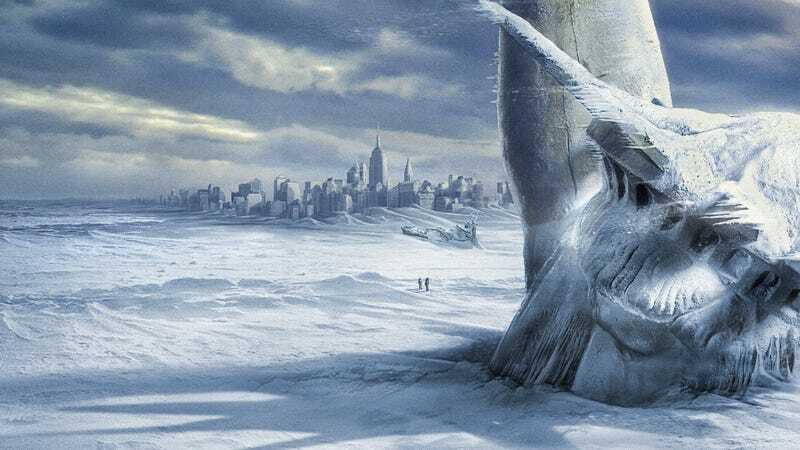 The idea of the Earth reverting to its prehistoric past made for a great narrative and, in the late 1970s, the record cold winters provided a perfect story peg. A major climatic change would force economic and social adjustments on a worldwide scale, because the global patterns of food production and population that have evolved are implicitly dependent on the climate of the present century. It is not primarily the advance of a major ice sheet over our farms and cities that we must fear, devastating as this would be, for such changes take thousands of years to evolve. This trend of selective quoting has continued. In 2003, for instance, James Schlesinger wrote an editorial in the Washington Post, "Climate Change: The Science Isn't Settled," citing a quote from a 1972 study published by the National Science Board, the governing body of the National Science Foundation: "Judging from the record of the past interglacial ages, the present time of high temperatures should be drawing to an end . . . leading into the next glacial age." The same quote was entered into the Congressional Record by Senator James Inhofe (R-OK). Judging from the record of the past interglacial ages, the present time of high temperatures should be drawing to an end, to be followed by a long period of considerably colder temperatures leading to the next glacial age some 20,000 years from now. However, it is possible, or even likely, that human interference has already altered the environment so much that the climatic pattern of the near future will follow a different path. For instance, widespread deforestation in recent centuries, especially in Europe and North America, together with increased atmospheric opacity due to man-made dust storms and industrial wastes, should have increased the Earth's reflectivity. At the same time increasing concentration of industrial carbon dioxide in the atmosphere should lead to a temperature increase by absorption of infrared radiation from the Earth's surface. A consensus on global cooling does exist—but only in the minds of climate-change deniers who grasp at straws to discredit the very concept of scientific consensus. What better way to illustrate this than the following video compilation of Fox News "experts" talking about the alleged ice age panic of the 1970s. Enjoy.